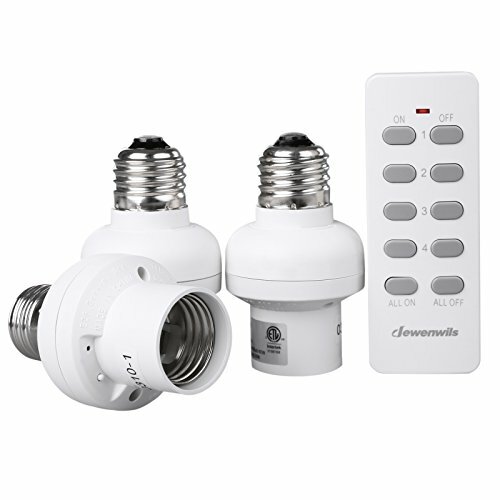 3 pack lamp socket set with 1 remote controller apply to E26/E27 incandescent bulbs, CFL & LED lamps. Easy to install and convenient for home / office use. You can remotely turn on lights in darkness or turn off without getting out of bed or chair. Simplify your life with this great lighting fixtures. Totally 5 sets of ON/OFF buttons. 4 sets have been paired with 3 lamp sockets as individual ON/OFF and All ON/ALL OFF. 1 spare set can be used to add more lamp sockets. You can control 1 or all sockets at a time. You can also change the pre-set configuration to meet your needs. The All ON/ALL OFF buttons will automatically control sockets which has been paired with 1-4 sets of buttons, so no need to be re-programmed. Each cap has a small button for re-programming or manual switch. Strong radio frequency transmission can work through walls and doors to control lamp as far as 80ft in line of sight. The wireless range may be shortened by other electronic devices, appliances, walls, or other physical barriers, so in actual use, the distance maybe slightly lesser than 80ft. Please measure the size carefully before you buy if you want to use it under lampshade or in tight space. For customers who ordered multiple units, please feel free to contact us if you have problem with re-programming.